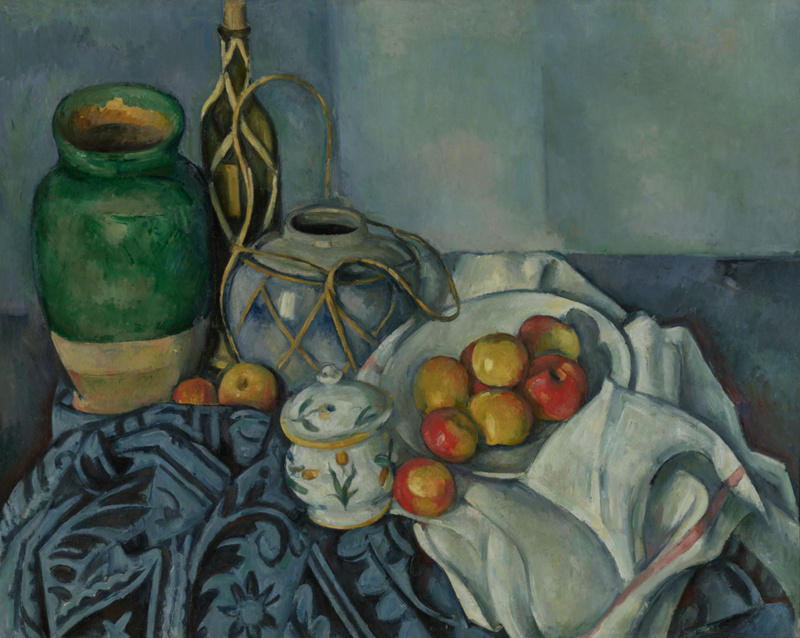 During the last thirty years of his life, Paul Cézanne painted the same objects--the green vase, the rum bottle, the ginger pot, and the apples--over and over again. His interest was not in the objects themselves but in using them to experiment with shape, color, and lighting. He arranged his still lifes so that everything locked together. Edges of objects run into each other; for example, a black arabesque seemingly escapes from the blue cloth to capture an apple in the center; the sinuous curves of the blue ginger pot's rattan straps merge with other straps on the body of the bottle behind. Giving form and mass to objects through the juxtaposition of brushstrokes and carefully balanced colors and textures, he gave the painting a sense of comforting stability. Hugo Cassirer, 1869 - 1920 (Berlin, Germany), held in a trust upon his death, 1920. Source: JPGM Paintings Department, curatorial files, communication from Artemis Fine Arts Ltd., March 25, 1996. Private Collection (Switzerland; on loan to the Kunsthaus, Zürich until 1995), sold through Artemis Fine Arts Ltd. (London, England) to the J. Paul Getty Museum, 1996. Fortlage, Arnold. "Die Internationale Ausstellung des Sonderbunds in Köln." Die Kunst für Alle 28, no. 4 (November 15, 1912), p. 88, ill.
Fortlage, Arnold. "Die Internationale Ausstellung des Sonderbundes." Der Cicerone 4, no. 14 (July 1912), p. 550, fig. 4. Internationale Kunstausstellung des Sonderbundes Westdeutscher Kunstfreunde und Künstler zu Cöln, exh. cat. (Cologne: Städtische Ausstellungshalle, 1912), p. 31, no. 129, fig. 19. Vollard, Ambroise. Paul Cézanne (Paris: Éditions Georges Crès, 1919), ill. facing p. 92. Cézanne-Ausstellung: Cézannes Werke in deutschem Privatbesitz, exh. cat. (Berlin: Paul Cassirer, 1921), p. 40, no. 32. Venturi, Lionello. Cézanne: Son art, son oeuvre. 2 vols. (Paris: Paul Rosenberg, 1936), vol. 2, pl. 193, no. 598. Venturi, Lionello. Cézanne: Son art, son oeuvre. 2 vols. (Paris: Paul Rosenberg, 1936), vol. 1, pp. 57, 194, no. 598. La Pintura francesa, de David a nuestros días, exh. cat. (Buenos Aires: Museo Nacional de Bellas Artes, 1939), p. 39, no. 10. Loran, Erle. Cézanne's Composition: Analysis of His Form with Diagrams and Photographs of His Motifs. 2nd ed. (Berkeley and Los Angeles: University of California Press, 1947), pp. 76, 89. Orienti, Sandra, and Alfonso Gatto. L'opera completa di Cézanne (Milan: Rizzoli, 1970), pp. 122-23, no. 792, ill.
Orienti, Sandra, and Ian Dunlop. The Complete Paintings of Cézanne (London: Weidenfeld and Nicolson, 1972), pp. 122-23, no. 792, ill.
Chappuis, Adrien. The Drawings of Paul Cézanne. 2 vols. (London: Thames and Hudson, 1973), vol. 1, p. 31n54. Orienti, Sandra, and Gaëtan Picon. Tout l'oeuvre peint de Cézanne (Paris: Flammarion, 1975), pp. 122-23, no. 792, ill.
Elderfield, John. European Master Paintings from Swiss Collections: Post-Impressionism to World War II, exh. cat. (New York: Museum of Modern Art, 1976), pp. 30-31, ill.
Rilke, Rainer Maria. Briefe über Cézanne. Clara Rilke, ed. (Frankfurt: Erschienen Im Insel-Verlag, 1977), p. 48, pl. 7. Adriani, Götz. Paul Cézanne: Aquarelle, exh. cat. (Tübingen: Kunsthalle, with DuMont Buchverlag, 1981), p. 280, under no. 88. Adriani, Götz. Cézanne Watercolors. Russell M. Stockman, trans. (New York: Harry N. Abrams, 1983), p. 280, under no. 88. Rewald, John. Paul Cézanne, the Watercolors: A Catalogue Raisonné (Boston: Little, Brown and Company, 1983), pp. 134, 230, under no. 204, under no. 563. Rewald, John. Cézanne: A Biography (New York: Harry N. Abrams, 1986), p. 210, ill.
"Das Tor zur Moderne. Paul Cézanne in Schweizer Sammlungen." Du, no. 9 (September 1989), p. 24, ill.
Adriani, Götz, ed. Cézanne Gemälde, exh. cat. (Tübingen: Kunsthalle, with DuMont, 1993), pp. 184-85, no. 58, ill.
Cachin, Françoise, et al., eds. Cézanne, exh. cat. (Paris: Galeries nationales du Grand Palais; Éditions de la réunion des musées nationaux, 1995), pp. 386-87, no. 160, ill., entry by Isabelle Cahn. Rewald, John, Walter Feilchenfeldt, and Jayne Warman. The Paintings of Paul Cézanne: A Catalogue Raisonné. 2 vols. (New York: Harry N. Abrams, 1996), vol. 2, p. 264, no. 770, ill.
Rewald, John, Walter Feilchenfeldt, and Jayne Warman. The Paintings of Paul Cézanne: A Catalogue Raisonné. 2 vols. (New York: Harry N. Abrams, 1996), vol. 1, p. 467, no. 770. "Acquisition of the Year." Apollo 144, no. 418 (December 1996), p. 15, fig. 1. Gribbon, Deborah. "Selected Acquisitions Made by the J. Paul Getty Museum, 1995-97." Burlington Magazine 139, no. 1136 (November 1997), p. 821. Jaffé, David. Summary Catalogue of European Paintings in the J. Paul Getty Museum (Los Angeles: J. Paul Getty Museum, 1997), p. 25, ill.
Fredericksen, Burton B., et al. Masterpieces of the J. Paul Getty Museum: Paintings (Los Angeles: J. Paul Getty Museum, 1997), pp. 110-11, no. 60, ill., entry by Jennifer Helvey. Walsh, John, and Deborah Gribbon. The J. Paul Getty Museum and Its Collections: A Museum for the New Century (Los Angeles: J. Paul Getty Museum, 1997), pp. 109, 133, ill.
Rowell, Margit. Objects of Desire: The Modern Still Life, exh. cat. (New York: The Museum of Modern Art, with Harry N. Abrams, 1997), p. 20, ill.
Barker, Emma. "Exhibiting the Canon: The Blockbuster Show." In Contemporary Cultures of Display. Emma Barker, ed. (New Haven and London: Yale University Press, with The Open University, 1999), p. 142, pl. 92. La Rie, E. René de. Conservation Science Unvarnished (Amsterdam: Stichting Bijzondere Leerstoel voor de Chemie van Conservering en Restauratie, 1999), pp. 15, 17, fig. 7. The J. Paul Getty Museum Handbook of the Collections. 6th ed. (Los Angeles: J. Paul Getty Museum, 2001), p. 140, ill.
Allen, Denise, et al. Masterpieces of Painting in the J. Paul Getty Museum. Rev. ed. (Los Angeles: J. Paul Getty Museum, with Thames & Hudson, 2003), pp. 106-7, no. 57, ill., entry by Jennifer Helvey. Armstrong, Carol, ed. Cézanne in the Studio: Still Life in Watercolors, exh. cat. (Los Angeles: J. Paul Getty Museum, 2004), pp. 16-17, fig. 8. Schmidt, Bertram. Cézannes Lehre (Kiel: Ludwig, 2004), pp. 267-69, fig. 80. The J. Paul Getty Museum Handbook of the Collections. 7th ed. (Los Angeles: J. Paul Getty Museum, 2007), p. 142, ill.
Rishel, Joseph J., et al. Cézanne and Beyond, exh. cat. (Philadelphia: Philadelphia Museum of Art, 2009), pp. 250, 533, pl. 76. Alsdorf, Bridget. "Interior Landscapes: Metaphor and Meaning in Cézanne's Late Still Lifes." Word & Image 26, no. 4 (October-December 2010), pp. 314-23, figs. 1, 4, 5. Martineau, Paul, ed. Still Life in Photography, exh. cat. (Los Angeles: The J. Paul Getty Museum, 2010), p. 11, ill.
Lanchner, Carolyn. Paul Cézanne (New York: The Museum of Modern Art, 2011), pp. 33, 35, fig. 12. Sonntag, Stephanie, ed. 1912-Mission Moderne. Die Jahrhundertschau des Sonderbundes (Cologne: Wallraf-Richartz-Museum & Fondation Corboud, with Wienand, 2012), p. 41, ill.
Schaefer, Barbara, ed. 1912 - Mission Moderne: Die Jahrhundertschau des Sonderbundes, exh. cat. (Cologne: Wallraf-Richartz-Museum & Fondation Corboud, 2012), pp. 346-47, no. 21, ill., entry by Barbara Schaefer. Shiff, Richard. "Cézanne." In 1912 - Mission Moderne: Die Jahrhundertschau des Sonderbundes, exh. cat. Barbara Schaefer, ed. (Cologne: Wallraf-Richartz-Museum & Fondation Corboud, 2012), p. 92. Molnos, Péter. "The Paintings of Paul Cézanne in Hungarian Private Collections." In Cézanne and the Past: Tradition and Creativity, exh. cat. Judit Geskó, ed. (Budapest: Museum of Fine Arts, 2012), pp. 216-18, fig. 124. Smith, Paul. "Cézanne's Color Lab: Not-So-Still Life." In The World is an Apple: The Still Lifes of Paul Cézanne, exh. cat. Benedict Leca, ed. (Hamilton: Art Gallery of Hamilton, with D Giles Limited, 2014), pp. 111-12, 120-23, 134, fig. 8. Benson, Timothy O., ed. Expressionism in Germany and France: from Van Gogh to Kandinsky, exh. cat. (Los Angeles: Los Angeles County Museum of Art, with DelMonico Books, 2014), pp. 19, 276, ill.
Molnos, Péter. Lost Heritage: Hungarian Art Collectors in the Twentieth Century (Budapest: Kieselbach, 2018), p. 389, ill.
Feilchenfeldt, Walter, Jayne Warman, and David Nash. "Nature morte avec pommes, 1893–94 (cat. no. 855)." The Paintings of Paul Cezanne: An Online Catalogue Raisonné. Walter Feilchenfeldt, Jayne Warman, and David Nash, eds., http://www.cezannecatalogue.com/catalogue/entry.php?id=747 (accessed November 13, 2018). This lesson plan explores still-life painting. Students define the genre and practice watercolor technique. This lesson plan explores still-life painting. Students create a still-life painting in watercolor from direct observation. This lesson plan explores still-life painting. Students paint a still life in an opaque medium and write an artist's statement.